Hello. I need your help. I need the photos (actually as many as possible) of St Victor's statue from Van der Goes ( I don't know how to spell it, sorry) from Glasgow. It is the only picture of it, that I have found, but I need photos. Igor, do you know where in Glasgow the statue is? If so, I might be able to take a photo, provided it's not too far away from where I am. I don't know how to write it in English, but I think that it is a temple called Van Der Goes (it is the transliteration from russian book - that's why I am not sure how to spell it). Maybe I'll learn it in a few days and I'll write. If you make the foto - I'll be very thankful. There was an artist with the name Hugo Van der Goes, who worked in the late 15th century. Could it be that he was the artist who made the sculpture? St. Genevieve is a work of Hugo Van der Goes. So far, I have not found any Van der Goes works about St. Victor on the internet. The artists name is Van der Goes, the piece used to be in the Municipal Gallery in Glasgow. Whither or not it still is I do not know. from what I know it is not a statue. it is a painting. I'll try and find it for you. From Charles Ffoulkes, 'The most curious of these reinforcing plates is to be found in the picture of S. Victor by Van der Goes, circ. 1450, which is now in the Municipal Gallery at Glascow." (The Armourer and His Craft, 1912, pp. 50-51). Picture from a thread on the Armour Archive (don't remember the thread, just grabbed the pic a while back). You should be able to do a search on it. The piece is in the Kelvingrove Art Gallery & Museum, which is basically down the street from me. Sadly, the photos I got today were all blurry. I'll try again tomorrow. 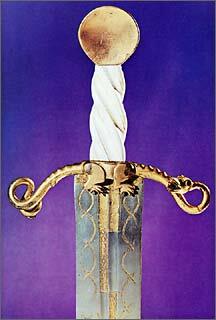 1 - The pommel to St. Victor's sword looks very unusual. 2 - Note the reflection of the priest in St.Victor's unusual breastplate, suggesting that the plate would have been finished to a mirror-polish. Does the pommel resemble an eared dagger pommel to you ? And yes it does look like a mirror polish on the breast plate. 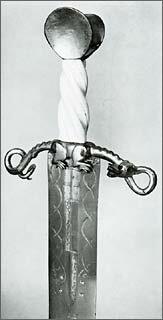 In regards to the pommel, it kind of reminds me of A&A's German Branch sword. I'll have to see if I can dig up a higher resolution pic to examine. As far as the finish on the armour goes, if I remember the discussion on the AA correctly, not only did they think it was polished to a mirror, but they were suggesting it was also blackened. Also, notice the gold/latten embelishments - interesting in that they are a bit out of place for decoration common to the period; more of a c14th thing than c15th. Lastly, notice the lance rest. Again, over on the AA, I think they were discussing why someone would have a tilting suit commissioned with a brigandine(?) or at the very least somewhat flexible midsection. The configuration of the harness, if genuine, would suit itself more to combat on foot, so why the lance rest? I'm embarrassed to say that I am not familiar with "an eared dagger pommel", but the description does sorta sound like what I think I am seeing. Of course, my old eyes aren't what they used to be. I should clarify that I am not debating the mirror polish - just that I thought it was interesting that Van der Goes showed it as such, with the reflection. 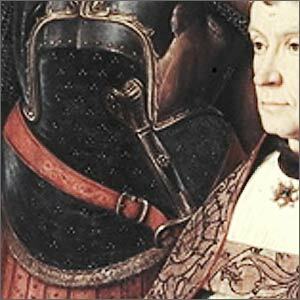 It does appear to me, too, that Van der Goes intended to show the breastplate as blackened. Ear-Dagger. Modern English term for a dagger with its pommel formed by two disc-shaped features ("ears") splayed outwards from the bottom of the grip, called "poignart a oreilles" in sixteenth-century France. The guard is usually formed by a slender spool-shaped moulding at the top of the grip. 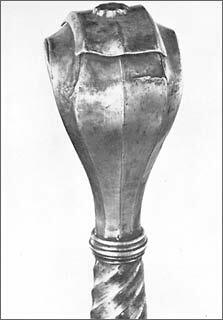 The "ear" hilt is Near Eastern in origin but was widely used in Spain from the fourteenth to the sixteenth century. Ear-daggers were probably also made and used in Venice, but this is by no means certain. They had a limited vogue in other European countries where they seem to have been regarded as entirely Spanish in origin. A number were made in France and England by the Spaniard Diego de Calais during the second quarter of the sixteenth century. The pommel in question sort of looks like a thickened "fish-tail" pommel (some sort of variant of an Oakeshott type V pommel? ), or something along those lines, in the drawing in ffoulkes. 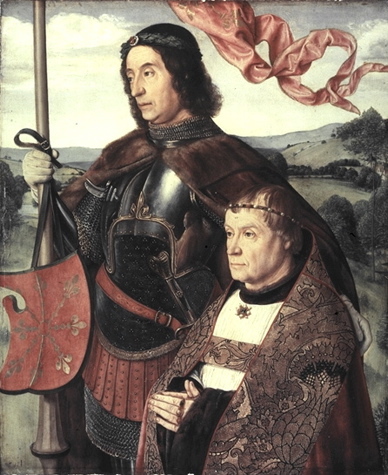 I wouldn't read too much into the reflection in the breastplate; artists of the period tried to outdo each other in their depictions of perspective and other techniques. It could just be the artist's way at saying "hey, look, I can even paint realistic reflections!". There is a brigandine with the small reinforcing plates ('placcates" ffoulkes calls them) in the chest with a lance rest shown in Charles ffoulkes's The Armourer and His Craft. ffoulkes also mentions two other reinforcing plates for brigandines that have attached lance-rests. The practicality of this is questioned, but they do exist. The picture of St. Victor is actually shown in the same context in ffoulkes. I've found a couple images of eared daggers on the net. The first is a detail of the pommel of an eared dagger, the second shows a couple different views of other examples of that sort of dagger. Thaks a lot. It really helps me. So that means, that the information in the book, I was reding, is not correct. P.S. Alexander Hinman, don't worry about the photos - I don't need them anymore. Anyway thaks a lot for your desire to help. definitely "à oreilles'', and Calizzano simply adds that this style was produced in regions "under the influence of the Republic of Venice", thereby not limiting the production to artisans in the repubic itself. Southwick's 1982 edition of his Price Guide to Antique Edged Weapons shows a couple of examples of Venitian and Spanish ear daggers, some pictures coming from the Wallace collection. I'm sorry, I'm still not equipped to scan. One thing though, the model shown in the painting is clearly to long to be a dagger hilt and I have never heard of a sword hilt finished " à oreilles", so maybe there are still some uncatalogued models out there somewhere which can be stranger than fiction, something for our artisan community to consider when they seek to go where no other swordsmith has gone before...but Jean, that does not mean that you have to be the one who draws the new plans for such a beast (une petite tentation en passant). Thanks, Richard. That is exactly what I thought I saw in St. Victor's sword. The more I look at the painting, the more I see it, too! Are there any other examples of swords with possible "eared" pommels? I don't think I've never seen any before, but that doesn't mean they don't exist. Maybe it's time to do some digging! Here are a couple from our Ornamentation: Fantasy vs. History topic.